Fr. Andre is originally from the San Francisco Bay Area. He and his wife Matushka Samantha bring a rich cultural and educational background to the mission. Fr. Andre’s parents moved to the United States from Colombia, South America, and Mat. Samantha’s parents are of Lebanese heritage. As such, they have each benefited from the rich traditions of two diverse cultures. They have four children. Fr. Andre earned a BS Degree from Pepperdine University in International Business and a MBA from the University of San Francisco. Mat. Samantha has a Master degree in Social Work and works part-time as a grant writer for various non-profit organizations. Prior to attending seminary, Fr. Andre worked as a mortgage banker for fifteen years and enjoyed a successful career in real estate finance. He attended St. Vladimir Theological Seminary in Crestwood, New York, and was ordained to the Holy Diaconate by His Grace, Archbishop Benjamin, on January 30, 2012. Soon after, he was ordained to the priesthood on March 10, 2013, and graduated the same year with an MDiv. 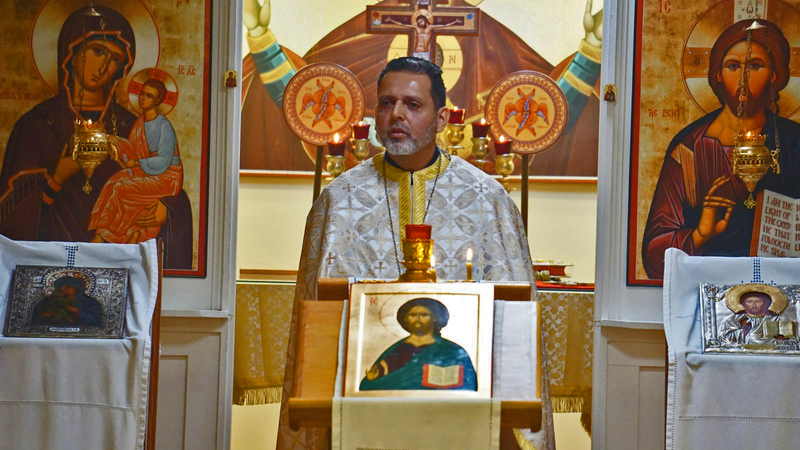 In addition to serving St. John the Evangelist Orthodox Church, Fr. Andre is a member of the Diocese of the West Desert & Mission Deaneries, serves as an auditor for the Diocese of the West, and is a member of the Arizona Council of Eastern Orthodox Clergy. He also holds certification as a trained facilitator of the Prepare/Enrich Premarital and Marriage Inventory.